I thought it'd be cool to incorporate some photos of our "language" as Gavin calls it. And it really is a language. I forget this until I have a conversation with a dancer in front of a non-dancer. Here is Yuka Iino rosining up before a rehearsal of Raymonda. The Rosin Box is kind of the equivalent of the water cooler in an office. Kind of like a home base for ballerinas and danseurs. I've been keeping my camera in my bag with me so I can capture the last week of rehearsals leading up to our June performance. Here are some of my favorite shots from today's Rubies rehearsal. As for me, I'm heading to Seattle for the weekend with Steven Houser and my roommate. We're planning on seeing PNB's All Robbins Program tomorrow where they perform Fancy Free, In the Night, and The Concert. OBT has performed In the Night and The Concert before, and we are reprising The Concert next season. I'm excited to see another company perform it. Mia recently asked me if I had seen the Late Show with David Letterman years ago when artists from the New York City Ballet aided Dave in the delivery of his famous Top Ten List. I hadn’t seen the episode, but I was able to find the list in the Late Show archives. It’s from April 8, 1996. 10) You gonna finish those cheese fries? 6) Baseball players can scratch themselves. Why can’t we? 3) I love the Quizstar 5000! Some of these are rather dated, but enjoyable still. Well, my foot is finally feeling more or less back to normal. Phew. Although, I'm going to continue to baby it up until we finish the season, which means a nightly routine of rolling it out on a golf ball to help with the knots, massaging from the tips of my toes up to the top of my calf, and then icing. That hurts a lot at first, but feels so good after about 1 minute. However, I can't do what a lot of dancers in the company can, which is sticking their feet in a bucket of ice water... That's just too much for me. :-). It's been a very interesting experience sitting out these last couple of days. As I mentioned in my last blog, I've never taken a day off. I missed class once my apprentice year because my alarm didn't go off, but aside from that, perfect attendance. I guess it's comes from a combination of loving what I do (a lot), and also a fear that the one day I'm not there, something amazing/exciting/important is going to happen. Our careers are so short, and I don't want to miss a second of it. Anyway, I've been so antsy sitting up front and watching everyone get to dance around, I'm practically counting the seconds until I get to take class again on Tuesday. I'm sure this all makes me sound like a crazy person, but I'm ok with that. I'm glad to see Adrian has finally started blogging. He is one of the people who helped me decide to write here, and he has a really unique perspective on things, so I hope you all enjoy what he has to say. A fun fact: Adrian and I first met at Pacific Northwest Ballet's summer program in 2003 and became great friends, we kept in contact after the program ended, and 5 years later, here we are working together. Small world. Tuesday we will have our first complete run through of Rubies and I'm both nervous and excited. I've only danced my sections in pieces, and I've been told it's a tough ballet to dance all the way through because it's extremely athletic. We also have a rehearsal with the pianist(s?) who are playing RUSH for us in DC, and I'm very interested to hear what the music is like live (or at least the piano sections of the music). When you rehearse over and over to a recording you get used to hearing certain things in the music which are sometimes less pronounced, or not there at all, when played live. It can be frustrating for a moment, but then the joy of have live music takes over and you don't notice after about the third time you do it with the orchestra. Ok, I think that's all the news from my corner of the world. I'll finish icing and watching Take Me Out to the Ball Game (starring Frank Sinatra and Gene Kelly) and then head to bed. It seems everyone's got a fever for blogging, and I am no different. 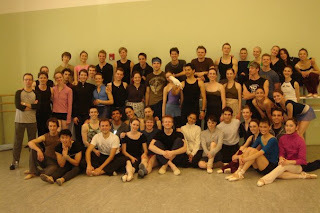 I'm excited to contribute to the blog community and give another male perspective on ballet. Excited to share with you soon. More to come. This site gives you the translations of the French terms for many common ballet steps along with a photo or video demonstration of a dancer executing them. There's a lovely picture of Susan Jaffe performing an arabesque and a penche, so you can see what I was trying to describe a couple of days ago. So, I'm in Rubies rehearsal today, dancing around with Yuka, and I do an off balance movement, my foot feels kind of weird, I stop moving for a second and... PAIN! I'm not really sure what happened yet, but I know I feel nervous. I just got home from seeing the wonderful Dr. Zeller (she's a great doc, one of the ballet's biggest fans, and always there when one of us needs her) and it doesn't seem like it's anything wrong with my metatarsals, so hopefully it's just some soft-tissue inflammation/irritation. I'm going to get P.T. tomorrow morning, and then take the day off. I haven't missed a day of rehearsal since I started dancing here, so I'm not too worried about them being upset over that. Not that they would get upset, it's just they worry when a performance is nearing, and someone has to miss rehearsal. Anyway, I've just gotten a bottle of red wine and waaay too much chinese food and I am preparing to ice and elevate my poor foot. Other goings on in OBT land: Jon Drake is unfortunately out for this rep due to an ankle injury, so we've had to hire Chauncey Parsons to come and dance Raymonda Corps/Soloists (I'm not entirely sure what we are in Raymonda) and Rubies Lead with Kathi. Chauncey currently dances with The Washington Ballet in Washington D.C. and he's a really nice guy. So, we're glad to have him around! Other than that, I think everything has been taught for this rep (I'm not positive about Tolstoy, but if it's not done I think it's close) and so now we're just cleaning everything. I was supposed to start learning someone's part in Tolstoy's Waltz tomorrow, and I'll still be there watching all my rehearsals, so I'll keep you all posted on that. Anyway, I'm going to go watch a movie and eat my food and ice my foot. Please send good thoughts my way! For those of us who don't dance, what's an arabesque? It's harder to explain than it is to demonstrate, unfortunately, but I'll try. An arabesque is one of the most familiar ballet positions to the general public--- it's the pose you'll see over and over again in pictures, posters, artwork, and on stage. The dancer is standing on one leg with the other extended out behind. The joke is that women spend at least 75% of their career in first arabesque, so they'd better get comfortable with it! (Although there are slight variances according to different traditions of technique, there are four different classical arabesque positions that are defined by the angle of the body and position of the arms. They're just named first, second, third and fourth arabesques). You mentioned in preset that you'd have quick costume changes. I may not have seen it correctly in performances, but some of the dancers look like they've got different tights/leotards as well as tutus/costumes. Are you literally completely changing each time or is there layering that you usually do to cut down on the time it takes to be ready? During any given ballet performance, you will likely see several different costumes appear on stage. If a dancer is performing in more than one ballet on the program, they will have to change costumes in between ballets (or in between acts if it is an evening-length work such as Swan Lake), usually during intermission. Sometimes, however, a particular role requires the dancer to wear more than one costume during a single ballet, so they will have to change during the piece at some point. These costume changes are figured into the choreography so that there is enough time for the dancer to get out of one outfit and into the other one, but they're often pretty quick and therefore the dancer will change in what we call a "quick-change booth", which is basically a couple of curtains hung up in some corner backstage. There are dozens and dozens of ballets with quick changes, some of them legendary for their elaborate-ness and quickness! I have some stories about that... but I'll save them for the next post. But no, the only time we will "layer" any costumes is if the bottom layer is a unitard or leotard that can fit easily under something else. We generally hate to dance in costumes that are too bulky, heavy, hot, or restricting, so the fewer layers the better. With the elephant knees, how long (I know it's likely somewhat different based on the dancer) do tights last? Are they like dress socks where you wear them a couple times and after a few washes the elasticity combined with wear produces the elephant knees? Tights can last a really long time! They may end up with holes, but we don't tend to care too much about that and will keep wearing them anyway. They fade with time and can turn odd shades of gray (from the original pink), but since they are also oddly expensive (the ones that are my particular favorite are at least $15 a pair) we (or maybe just I) get thrifty and wear them for years. Eventually they reach a point of ridiculousness (scratchy and zero elasticity), and then the most lovely feeling in the world is a brand-new pair of tights on your legs. Not to elaborate on a mundane topic, but wearing comfortable tights is really a big deal, for the women especially. An uncomfortable pair (or leotard, or any article of dancewear) can be so distracting that I swear I can't dance as well. Elephant Knees: The state of a pair of tights when you've had them on so long that they've stretched out and lost elasticity. The knees get all baggy and look like... elephant's knees, I guess. Rosin Box: The shallow wooden box in the corner of the studio (and off stage in the wings) filled with powdered rosin. We step in the box and rub the tips and soles in the rosin for extra traction if the floor is at all slippery, and the women sometimes dip their feet in the rosin before putting their pointe shoes on to be extra sure the heels won't slip off. The men sometimes rosin their hands so they're more secure on their partner's costume for partnering. Preset: If you've got a quick costume change or are using a prop of any sort in a particular ballet, it's the dancer's responsibility to make sure those things are set up where they need them to be before the show starts. That way, the dancer knows exactly where their things are and can't blame anyone else if they're not ready! Marathon Show (aka Triple Whammy or Quadruple Whammy): This is just what it sounds like--- a performance that is so long and hard it feels like you are running a marathon. During Nutcracker, it's common for some of the women to have three or four roles in one performance (party scene, snow, marzipan; or party, snow, Spanish, flowers), hence the triple or quad "whammy". Six o'clock Penche: A penche is a ballet step that is essentially an arabesque taken a lot further. From an arabesque, the dancer tips forward with their torso while raising their leg behind them in equal dimension. The line to strive for is to have your leg so high it's pointing straight at the ceiling. In this case, your two legs look like they're hands on a clock at six and twelve. Six o'clock! More terms and definitions to come. If you've heard words or phrases and always wondered exactly what they meant, just ask! Another comment from balletfan: "It would be interesting to read about how different it must be for a first year member of the company, who was a student last year, and the adjustments that had to be made." Well, I have quite a bit to say about this, because this is a transition I made. Generally, it's not that big a contrast because you don't go straight from being a student to being a full company member. Between the two years, you are an apprentice. Being an apprentice means you are both a student, and a company member, at the same time. Which means, you guessed it, twice the work. Every year the apprentice's situation is a little bit different. I can really only speak with any authority on my year. Some things have changed, and some haven't. My apprentice year I was in two ballets a show, for almost every show (sometimes with more than one part per ballet). I was also dancing the lead in a very hard Balanchine ballet for the school show (La Source) as well as 2 parts in another ballet in the school show. I also had to send out videos and do an audition tour to find a job incase OBT didn't hire me. We were also rehearsing and performing a sort of mini introduction to ballet at various schools in the area. To top it all off, we received no pay. Fortunately for me, I grew up here and could live at home, but I know most of my fellow apprentices had to be supported completely by their parents. Now, I don't want it to sound like it was all bad. I gained a lot of performance experience, and my dancing improved dramatically. I also got a taste for what company life was like while still having the security of being in the school and knowing that no one expected me to be perfect, and that I was still learning. All in all, it was definitely a life changing experience. It worked well for me when all was said and done and now when I'm faced with difficult tasks I know that it's not going to be any harder than my apprentice year. Everyone's story is going to be different, but that's mine. Things are really getting under way for the Russian rep now. All three ballets are being rehearsed/created every day, making for lots of interesting music floating through the hallways (and lots of counts floating around in my head). We finished learning Rubies corps yesterday, which is a pretty big step. It's very complex and to have it all finished and in the cleaning stage this quickly means it will look that much crisper on stage. Rubies principal is going great! I'm getting to dance with Yuka, something that doesn't happen too often (Zais and Il Nodo are the only 2 that come to mind), but is always so much fun. She really knows how to communicate what she needs from her partner, which makes it easy to give her exactly what she wants and make her look good. Ok, I need to finish my coffee and then head to work. I've got Rubies principal all morning, and then Raymonda all afternoon. I thought I'd leave you with a group shot of OBT with the visiting companies, and Barney: The White Bird. Even though I'm back in regular shoes and on my own two feet, I'm still in the middle of the rehab process for my ankle injury. The rest of the company is hard at work in the studio every day, rehearsing for the last three ballets of the season, and I'm hard at work at the physical therapy clinic, looking for every gained inch of mobility and ounce of strength. I go there about four times a week for actual hands-on therapy, which includes soft tissue work, joint mobilization, and what they call "scar mobilization"--- that's the loveliest treatment of all. It means doing cross-fiber friction massage directly on the scar to break up the adhesions underneath it. Everyone says it's very important, but it feels so gross that I'm wondering how much I care about having a mobile scar. The other aspects of my sessions at PT are less unpleasant. The therapist works on getting some more degrees of flexion in my still-stiff ankle joint by basically teasing it further and further, coaxing it along as I resist and then let it stretch further. I'm having a lot of trouble with all the tendons surrounding the area where the repair was made, so we do a lot of flushing and scraping of my Achilles and posterior tibialis tendons to get them less irritated by the sudden uptick in load that they're being put under. When such weak muscles are suddenly asked to take some strain, they often seize up in response, so I do get a bit of calf rubbing to work out the protest knots. Then I'm turned loose into the gym to do my exercises, which can take quite a while since there's really no end to what I can work on. The major focus for the ankle itself involves getting back basic strength and stability. So I do a series of exercises on the balance board and Airex pad, which are unstable surfaces, to re-train my legs and feet to stabilize themselves. There are basic calf raises, but also a lot of work on controlled strength as opposed to just straight repetition. The latest one has me balancing on one leg on the balance board while tossing a ball back and forth to someone. That is hard enough on a "normal" leg. I pretty much started to quiver in fatigue after about a half a minute. Here are the tools of my current regimen. There's the balance board (also called a rocker board), the blue foam Airex pad, the half-foam (I use that for calf raises and more balancing work), my friend the Magic Circle (adductor strengthening), and the family of Therabands for my foot exercises. The pig is named Oliver and he's the cheering section. In addition to ankle-focused therapy, I have a little routine of whole-body maintenance exercises that I do every day to make sure the rest of me will be in good dancing shape when my ankle is ready to go back to the studio. I do several different kinds of core strength exercises, hamstring curls, pushups, and a few times a week I get onto the Pilates reformer for more of the same. One of my favorite/least favorites is the "clam shell", which is hard to describe but is the best turnout strengthener around. There's also a half hour of cardio on a stationary bike and a bunch of different stretches. That stuff is invaluable, and honestly I'll probably be stronger in some ways than before this injury happened. After all the physical work is done for the day, I do a really good ice-down, massage some Traumeel into my ankle and foot. At some point each day I also do a contrast bath, when I stick my leg first into a bucket of ice water, then into hot water, and back and forth for 15 minutes. That's the best way to flush blood into the area and also helps loosen up the joint even more. While my foot's in the hot water I do toe curls for the intrinsic muscles on the bottom of my foot. And last thing before bed every night is another ice-down, preferably with my foot elevated over my head, since there's still a fair amount of swelling that happens by the end of the day, especially if I've been up and about a lot. This whole routine is keeping me busy. I have to say that a lot of it comes from knowledge I've picked up over the years (and from the various injuries and therapies), so although there are always a lot of unknowns I do feel a fair amount of confidence in how I'll come out of this episode of my career. And there are always interesting things to be learned about one's body and mind when going through something like this. What a couple of days it's been! I apologize for how long it's taken me to write another blog, but when we start performing I sort of unintentionally go into hiding from anything but ballet and the people I dance with. I guess it just helps me stay focused. So, let me catch you all up to speed. Last Thursday and Friday Portland hosted 4 major West Coast ballet companies, Oregon Ballet Theatre (go team! ), Pacific Northwest Ballet, San Francisco Ballet, and Eugene Ballet, for it's "4x4: The Ballet Project" show. It was so much fun! It's always wonderful and exciting to meet new people from different companies, and see some familiar faces as well. For those of you who don't know, the ballet world is infinitely small. It turns out someone who I went to a summer program with in 2002, now dances with Eugene Ballet. I'm pretty sure almost every person in every company attending has a similar story. Every time people from different companies get together, we discover that we're connected in more ways than we realized. It's really a lot of fun. Anyway, back to the shows. Eugene Ballet presented a piece called "Still Falls the Rain" choreographed by their Artistic Director Toni Pimble. It was a piece I had seen a year before and every time I see it, I like it more. There's a lot going on and some subtle stuff that without repeat viewings is easy to miss. We, OBT, performed Christopher Wheeldon's "RUSH", the piece we'll be dancing at the Kennedy Center in June. I think we made a very strong showing, and I enjoyed performing the ballet more than I was expecting to, so that was a pleasant surprise. San Francisco Ballet brought "Concerto Grosso" by Artistic Director Helgi Tomasson (we have performed his Twilight and Blue Rose here). I'm still trying to wrap my head around the amazing male dancing I saw in that ballet. I saw it a total of 3 times, and every time I had to grab the person next to me about every 10 seconds, because what I was so was incredible. To finish off the evening, Pacific Northwest Ballet performed "Shindig" by one of their Principal Dancers, Olivier Wevers. It was a cute little ballet with some pretty exciting dancing (especially in the final solo danced by Carrie Imler, one of my all time favorite dancers). So, after 2 days off, Monday was back to work as usual. Yuri Possokhov is now in town to start Raymonda. We had a rehearsal for the dance for 4 men yesterday (which was the first variation I ever learned the first time I went away to a summer program... I still remembered it!). Following that was a short Rubies rehearsal for the men (a lot of the 3rd movement has to be taught to the men and women separately because we do such different choreography). Since I was done early, Adrian and I decided to watch a movie. He had "Gene Kelly: Anatomy of a Dancer" from netflix, so that we watched that, then I cleaned my apartment. While cleaning I checked the rehearsal schedule online (it hadn't been up yet when I left after rehearsal) and I got a huge shock. I'm called to the rehearsal for the Rubies Principals! I'm not sure who I'll be partnering yet (either Yuka, Kathi, or Ansa), but as I've talked about before, this ballet is one of my favorites and just learning the corps has made me think a lot about how far I've come, how I've grown, and how much more growing there still is to do. So, learning Principal is kind of like, the cherry, on top of the icing, on top of the cake for me. Anyway, off to work! Have a great Tuesday! Each dancer typically orders her shoes in batches of about 20 pairs. I've recently had to do some major changes to my order because my longtime maker (Club, like the card suit) started becoming strangely inconsistent and produced shoes with increasingly tapered boxes and slanted tips. It got so bad that these shoes were throwing me off pointe and it was nearly impossible to balance. They were also getting so narrow at the tip that I could barely sqeeze my foot in there! Belinda Talbot (who oversees all of our shoe issues here at OBT, including budgeting, ordering all 2,000 pairs each season, and communicating with Freed) tried to send back several of the worst pairs to Freed to have them remade. Freed wouldn't do it, because they did not agree that the shoes weren't up to par. So I was left with no option but to switch makers. This is not something to be taken lightly! There are currently 23 different shoemakers at Freed and each one's shoes have a distinct shape and style. I had to find another maker that would work as well for me as Club had before his downslide. Before gambling on a new maker with an order of 20 or more pairs, we ordered "trials" from several different makers. Trials are exactly that--- a trial order of just three pairs, in your own specifications, to determine if shape, weight, and style are what you want. Freed provides a list of currently available makers with a vague description of what their shoes are like ("average", "heavy", "square"), but there's no way to know what the real shape of the box is like without seeing and wearing them. I can't even remember how many makers we ordered trials from (they had just started coming in when I got injured), but here's one from Maker C.
Here's a look down the barrel of the gun. You can see the glue that I put in the tip. And here is the what the bottom of the shoe looks like after I've worn it. I write the date when I first wear that pair, along with an "R" and "L". (Until they've been worn more than once, it's hard to tell which one was right or left, but you can feel the difference once you've put them on. Writing it on the bottom just saves a moment of having to switch shoes). These ones were maker V, which were another of my trial pairs. I recall liking the V's quite a bit. They're tapered just the right amount and yet have a flat platform (that's what it sounds like-- the flat tip on which we stand). They might likely end up being a big part of my next real order. I also learned that the shoemakers are an eclectic group of guys, working away in an old-fashioned shoe factory with a stitching machine that dates from 1964 and is irreplaceable. Some of them have been working there for decades, but mostly the makers are now younger and less experienced, which causes concern amongst the old-timers that their trade won't be passed on. Some of them take an interest in the art that they give life to, but some have never seen a ballet and don't care to. The work is physically very hard, and there are a lot of repetitive stress injuries. I'm sure this is exacerbated by the fact that the makers are paid by the shoe and the most experienced makers turn out about 40 pairs a day (the relatively new guys average only 25-30). It's ironic that they are working so hard and trying to do it so fast, but our constant complaint is that they're too slow and the shoes take too long to arrive. According to the most recent update from Freed, the makers' delivery times range from three months to "unavailable" or "restricted", which means that they're so swamped they won't take new orders. Trials usually come more quickly (I guess you get bumped to the front of the line in anticipation of a big order), which makes me wonder if they really are a good example of the what a full order would look like. For the most part, we're waiting 4 to 6 months for a shipment of shoes to arrive after an order is placed, which is why planning ahead (and foreseeing the future) is so important. An unexpected disruption in the supply line (like my Clubs running off road) makes a dancer's life crazy--- it's like a painter being told they have to produce the same quality brushwork using Q-Tips. (Maybe Q-Tips are great for painting, I don't really know). But that's the idea. I wonder how the shoemakers feel about the fact that their bread and butter, our pointe shoes, are so dissected and criticized by us? Would they take it personally? Do they care? You've seen it from Steven's eyes, now here's a look at what a day is like for Mia Leimkuhler, another OBT dancer that has agreeably let us virtually job shadow her for a day. I wake up every day at 7:40am. There, that's one hint to the deep-running OCD that accounts for so many of my idiosyncrasies--I wake up at 7:40 because it's ten minutes more sleep than 7:30 but five minutes more time than if I woke up at 7:45. And by wake up I mean that I am up, I am resetting the alarm that rouses me from my slumber with the classical radio station. I know a lot of dancers who don't eat breakfast (something about not being able to eat anything early in the morning), but I can't imagine that. Breakfast gets me out of bed. I honestly get excited if I wake up and remember that I have fresh berries in my fridge or a shiny, brand-spanking new box of cereal to rip into (for the record, I'm disturbingly addicted to the frosted flakes they sell at Whole Foods). I learned the hard way, though, to put my glasses on before embarking upon breakfast; when you're groggy and partially blind the carton of chicken broth looks identical to the carton of soymilk. I drive to the studio around nine-ish, earlier if I have physical therapy that morning or later if I couldn't manage to put together a decent-looking normal, pedestrian, non-lycra/microfiber outfit. Once at OBT I change into a non-pedestrian lycra/microfiber outfit, coax my hair into something that resembles a French twist and stretch out my major muscle groups before class begins at ten. Once class begins we all focus and work very hard. Rehearsals are scheduled in blocks from 11:45 to 2:30 and 3:30 to 5:30, and depending what I'm rehearsing/involved in I could have a short day (read: out of the building by 2:30) or be at OBT until 5:30. We rehearse the ballets that are to be performed in the next program, or even in the program after that. There's always something to be rehearsed, fine-tuned and perfected, and I'm happiest when I'm in the studio pouring myself into a piece of choreography. Fun fact: In a rehearsal day that lasts until 5:30, I usually go through a wardrobe change of about three or so leotards. Those things become un-ladylike-ly (I'm fully aware that that isn't a word) sweaty and stinky and really, it's no fun being in a wet lycra onesie. So by the end of a full-day rehearsal week I've plowed through at least fifteen leotards and just as many pairs of tights. Not to mention a week's worth of normal-people clothes. So much laundry! This is why I dream of having a lovely washer and dryer set in my own apartment. Not in my own building, which I have, but physically in my apartment. My heart flutters at the thought of never having to make that desperate run to Trader Joe's at 8:57pm to buy, oh, a tin of mints and ask for a roll of quarters as my cash back. Once home I throw down my bag, kick off my shoes, open my fridge and think about dinner. That's a lie, I've most likely been thinking about dinner since four pm. I'm quite good about cooking for myself. It's a good way to save money, I make lunches of leftovers, and by cooking for myself I ensure that I'm eating exactly what I want prepared exactly the way I want it. My fridge is abnormally full; I've learned this by peering into the fridges of friends and coworkers. Not only does my Fridgidaire contain aforementioned leftovers from previous meals, but the leftovers of the ingredients that went into said meals, various condiments for various cuisines (Asian sauces, salsas, jams and confits, the ubiquitous ketchup/catsup and about half a dozen mustards), and the binding building blocks of baking (hello, alliteration!) --eggs, butter, sugar, flour. The only fridge I've seen that resembles my apocalyptic food vessel is that of my downstairs neighbor, and she has two other mouths to feed. I only have to account for my own. But I like cooking, and a little pottering about in the kitchen is a nice way to unwind. Except for when I burn myself or realize I'm missing one crucial ingredient. Then it's not so relaxing. After dinner there's email, the gym, French class on Wednesday nights, television (sweet, sweet HBO), shower, reading, bed. Elaboration: the gym happens because it helps keep my stamina up if I'm not rehearsing much in a given week, plus I enjoy the endorphins and it ensures that I'm wiped out and will hopefully sleep well. French class is a recent development, I'm enjoying being back in a school environment and fall upon my homework with what can best be described as furious purposefulness. I indulged in HBO this past summer and, like any true addict who's "only trying it and will give it up really soon," I'm, well, not. I climb into bed squeaky clean and read until my eyelids become very heavy and I realize that I've been reading the same sentence for the past five minutes. I click my bedside lamp off, compile a mental list of what needs to be done tomorrow, and with any luck I'm out. It's not all that interesting, and aside from the spandex part it's probably close to any other working stiff's day. Granted that I have to pay more attention to the upkeep of my body more than, say, the guy at Trader Joe's who begrudgingly hands me a roll of quarters, but everything before and after the OBT part seems like a fairly common routine. When people ask me to describe what my life is like, what my working hours are and what I do with them, I explain that my job as a dancer with OBT functions like your given nine-to-five job, except that instead of sitting at a desk behind a computer I'm on my feet, dancing around. They then nod and look at me as if I'm five. Or crazy. Or else they ask me if I'm going to school (ha, I can now say yes, thank you non-credit French class!) or if I went to school. Usually I'm honest, explaining that instead of going to college I took my job with OBT, that essentially I found a job right out of high school (you know, just like Kobe Bryant). As a comment on my last post balletfan asked if I thought that the famous George Balanchine quote "ballet is woman" was true. I did some looking around the internet and found what seems to be the full quote: "Ballet is Woman. In sports, it's Mickey Mantle. In politics, it's Eisenhower. In ballet, it's woman. Women are lighter, more flexible. They move more beautifully. He is not the King, but she's the Queen"
I think that to Balanchine this was completely true. But, he was an artist, and contrary to popular belief, he is not the end-all be-all of ballet (my friend are going to laugh so hard at this, I'm a die-hard Balanchine fan). There are many choreographers who don't agree with Balanchine's philosophy, most famously, Maurice Bejart. I actually think at one point, in response to Balanchine's "ballet is woman" comment, Bejart said "Ballet is Man." For him, the male physique was ideal for the type of ballets he wanted to create. I think it just depends on what the choreographer is most inspired by, and for Balanchine, that was women. Also, a thought that just occurred to me: Balanchine was born in 1904, and it seems like growing up in Russia at that time there were probably some pretty strict gender roles in play. In the quote he says men are the epitome of politics and sports, and I can't help but wonder if the thought of women being ballerinas and men being politicians and sports players didn't somehow stem from being a child in the early 20th century. Anyway, those are just my thoughts. What do you all think? Hi! So, I’ve been toying with the idea of writing for the blog for a while now, and with a little encouragement from some friends, here I am! A little bit about me: My name is Steven Houser and I am currently a Soloist at Oregon Ballet Theatre. This is my 3rd year as a full company member. The year before that I was an apprentice, and the year before that I was in the school. I was born and raised right here in Portland, OR (not too far from the studios actually) and couldn’t imagine a better city to grow up in. Anyway, I thought I would tell you all a little bit about my day today and yesterday. Yesterday began with class at 10 am at our studios, as it does most days. Christopher taught, and I felt like I had a pretty good class. After that I had an hour of rehearsal for the corps of Rubies, the Balanchine ballet that is coming up in our Russian Program. It’s been really interesting learning Rubies, because the last time the company did this ballet I was in the school. I remember going to the show and thinking “Wow, what an incredible ballet!” Ever getting to learn and dance something that great seemed like somewhat of a pipe-dream at the time, so being in the studio learning it now is really a bit surreal. After Rubies I had a long break (12:30-3:30), so I went up to my apartment and got to work on sewing some leotards and shorts that have been waiting to be put together for some time now (Brennan Boyer and I have a smallish dancewear business and finding spare time to work can be very difficult). After that was finished I had a little lunch and then made my way down to the studio for a 2 hour RUSH rehearsal. RUSH is the Christopher Wheeldon ballet we are performing here in town for the White Bird “4x4” show this Thursday and Friday and again at the Kennedy Center for their "Ballet Across America" program. Our current challenge with the ballet is fitting the somewhat large cast onto the smaller stage of the Arlene Schnitzer Concert Hall. At times it feels a little bit scary, but I think that in the end all of us doing the movement in a smaller space is really going to make the ballet jump out at the audience a lot more than it would at the Keller Auditorium. I finished off the day by hanging out with my friend Adrian Fry and some friends of his on the Eastside Esplanade enjoying the nice evening. Today was pretty similar to yesterday. Our Ballet Master Lisa taught class, followed by an hour and forty-five minutes of RUSH, a two hour break, forty-five minutes of Rubies corps (and some very intense counting thanks to Mr. Stravinsky), and a short company meeting discussing some changes being made to our contracts for next season. So, after a quick visit to the Physical Therapist (nothing serious, just normal wear and tear), here I find myself sitting at home and writing this! I’m not sure what to write about other than my daily life as a company member of OBT. I remember when I was growing up I always wondered what life was like for professional dancers, and I think that something like this would have been absolutely fascinating to me. If anyone has any questions, feel free to post them in a comment here and I’ll be glad to answer them. Now, I’m off to go fold some laundry, make dinner, go over choreography, hopefully read a little, and then go to bed. What are the shoes called that men wear? Do they too have the flat looking stiff toe like the women's? If not, how are they able to get up on their toes like you do? How long does a pair of shoes last? I know that it's likely to be different for each ballerina, but is there an average? 100 pairs sounds like so many! Well, luckily (or not, depending on how you look at it), the men don't actually ever dance "on their toes", or on pointe, as the women do. They wear softer slippers made of either leather or canvas that don't have a hard toe box like pointe shoes do. The sole of the mens' shoes are somewhat stiff, but not nearly as hard as the shank of a pointe shoe. I think most of the men wear what we call "split sole" shoes now, which means that there are two separate pieces of material on the bottom of the shoe, one under the ball of the foot and one under the heel. The material in the middle is gathered together to make the shoe form more nicely to the foot and hug the arch. Men aren't immune to shoe problems, but theirs aren't custom made and they last a lot longer than pointe shoes do, so they're generally less problematic. As far as how long pointe shoes last, that's an interesting question because it really does vary a lot. Generally, given their price (round about $80 a pair, but I'm trying to find out the exact price for us-- I think we get a discount for buying in bulk), their life span is ridiculously short. However, there are certain "makers" (each shoemaker has his own symbol by which we identify him, and we refer to them as Maker C, Maker Diamond, Maker Anchor, etc.) that are known to last longer than others. This might be because their shoes are harder or shaped differently, or just because they fit a certain dancer's foot really well. But then other makers are known to "melt", meaning they might be nice shoes but are more lightweight and just kind of disintigrate pretty quickly. Another huge factor is what exactly you are wearing those shoes for--- what particular ballet or role you're doing, and how hard or long your rehearsals are. A classical pas de deux nearly always requires very hard shoes because you spend so much time doing adagio work on pointe, there tend to be a lot of supported pirouettes, and if your shoes are soft your partner often can't find where your center of balance is. Performances of such a ballet call for a brand new pair, which I will have broken in slightly during class that morning. For rehearsals for something like that I might wear previously worn shoes, but they've still got to be pretty hard. But then there are other ballets that you don't want hard shoes for, or that actually work better in softer shoes. Even though you don't have the same support, in softer shoes you have more connection to the floor and more control over off-pointe steps. For class, I will either break in a new pair for a rehearsal or performance later that day, or will just pull out whatever I have handy in my shoe bin that I know I won't need for anything else. (One of the worst feelings is to realize that you "wasted" a really great pair of pointe shoes in class, and then can't use them for a rehearsal or performance). So, to answer the question (at last), there really is no one answer! With hard use, they can last you only a few hours, but certain pairs can last for days. A performance of a classical ballet will usually eat up a single pair in one night, but that pair might then still be usable for class or a rehearsal later. Sometimes a dancer will hit on a maker whose shoes are quite hard and heavy (some dancers prefer this, some hate it) and they'll last for several shows of a ballet that's less pointework-heavy. (We also use a type of glue intended for building model airplanes to add a little life to our shoes. A few drops seals the tip to make it less water-soluble. Unfortunately, it also makes them louder and if it leaks through to the outside, quite slippery). I would say an AVERAGE might be two or three days for the lifespan of a pointe shoe. For some of us it's longer, some it's shorter. There are so many variables that come into play having to do with different makers, techniques, foot problems, injuries, fluctuations in the quality and construction of the shoes, that it's impossible to give a specific answer. The endlessly fascinating topic of pointe shoes is the next chapter (or two) of this blog. It's such a huge subject in every way that I'll start out with some basic info, and then get into specifics. Please write in with specific questions about things you've always wanted to know about pointe shoes but have never had the chance to ask! Every woman in OBT wears pointe shoes every single day and none of the men do (yes, I know, that is verrrry basic information, but sometimes people ask!). Our pointe shoes are custom made for us at a factory in London by a company called Freed. Each of us goes through dozens and dozens of pairs per season, sometimes hitting 100 pairs or more. And they don't last very long. When they're dead, they go into a graveyard for resale at the OBT boutique (we sign them first). Each dancer has her own box on one of these shelves with her name on the front and her current supply of new, unworn shoes inside. As we need them, we come and pull out the number and type we need for the rehearsals, classes, and performances at hand. The reasons why we have the shoes custom made are several. For one thing, you've often heard that everyone's body is different, everyone's foot is different, and that becomes all the more apparent when you are trying to be expressive and technically proficient with those feet. Pointe shoes do a lot more than just hold us up, they also need to allow us to articulate every bone and joint in our feet, use every muscle and tendon, and jump, turn, stand, run, and balance. If all we had to do was stand there on toe, we could probably use tin cans with padding inside. Therefore, since we're dealing with such specialized footwear and each person's foot has unique characteristics, we all have minutely specific things we want from our pointe shoes. We specify not just size, but the exact measurements of every part of the shoe (down to an eigth of an inch), the type and weight of the shank (that's kind of like the inner sole of the shoe), the shape of the toe box and the tip, the cut of the vamp, even the material of the drawstring. Because we're so picky and specific in our orders (and not just "we", but every female ballet dancer in the world is this way), the shoes are made by hand by craftsmen with natural materials and fibers that will "breathe" and mold to our feet. There is nothing in the shoes that is synthetic (except maybe the glue): they are made of leather, cardboard, burlap, satin, cotton, and a water-soluble glue. No wood, no metal. The glue is what makes them so hard when they're new, and also what makes them so soft after they're worn (it breaks down with use and sweat, being water-soluble). The downsides to the handmade shoe are the variations in quality and consistency, and the length of time it takes to produce them. We are picky, picky, picky, but so would you be if you could experience how a pointe shoe can affect your dancing. A shoe can literally allow or prevent a dancer from being able to do certain things, like balance or turn, and a shoe that's wrong in even one small way can cause real physical problems-- not just corns or blisters, but actual injuries. Therefore, we ladies spend endless time discussing our shoes, poring over them, strategizing on how to tweak an order to make them better, agonzing with each other over a bad batch, consoling when a shipment is delayed and rejoicing when they finally come in. It is truly a never-ending subject of interest for us. Please give me feedback on what else you want to know so I can direct my next post accordingly! I forgot to mention that last Wednesday was also the 25th anniversary of the death of George Balanchine. Pardon me! Wednesday marked 9 weeks since the injury occured. We don't often think about what happens in our lives during a period of nine weeks, when everything's normal and we're going about our usual business, but this experience has made me look much, much more closely at the day-to-day passage of time. Not to get all philosophical, but it's worth it to consider that there's no way to slow time down better than to observe it every day. Wednesday was also the first day in nine weeks that I wore two normal shoes outside! I'd been going around the house boot-less for a week or so, but stepping outdoors in two regular shoes felt as free as my first foray out without crutches did. My friends know that since I discovered clogs two years ago I have hardly worn any other type of shoe-- I quite literally have worn my clogs virtually every single day--- so it was kind of funny to me that there was a coating of dust all over my poor ignored right clog. And finally, today marks 8 weeks since I had surgery. I want to say I've come full circle back to where I started, but am not even close to that. But at least I'm walking and starting to get my calf back. "The Craziest 15 Minutes of My Life"
Two weeks ago, on opening night of the American Program, an announcement was made to the audience before Slaughter on Tenth Avenue that Javier Ubell would be one of the cops in that evening's performance, in place of Ronnie Underwood. Few people, if any, knew why the change had been made, and maybe thought (if they cared to think about it at all) that the program had been misprinted or the change had been made too late to get printed at all. I was out front that night and wondered why Javier was going in for Ronnie (I'd just seen Ronnie dance in Eden's Gates so knew he wasn't out), but knew that something was up-- stuff like that doesn't just happen to give Thyra the thrill of making a live PA announcement. "I wasn't watching (the show), I was in the back in the dressing room when somebody told me that Ronnie had fallen running off stage in the wings and had twisted his ankle. So I went to him and asked if he was ok and he said he wasn't sure. Then Lisa came to me and told me I was on stand by for his part since he didn't have anyone to cover him. I was supposed to do Thug that night for Slaughter so I wasn't sure til the last minute what was going to happen. I had been learning cops, but not Ronnie's part, and all three cops have different counts. It was Jon Drake who had taught me the part during intermission because he was Ronnie's understudy, but since Jon was dancing Hoofer that night he couldn't go in. All three cops are basically the same but there are those different counts so I was nervous getting ready for the show. I wasn't really warm for the part because I thought I was doing Thug, but since all the Cops do are double tours I didn't worry that much. It's a very short part. After opening night Ronnie was still unable to do his part in Cops so I did both his part and my part for the rest of the run. But on the last show I got to do Thug, which I was really looking foward to!" Talk about adrenaline! Nothing like learning a part at the (very) last minute to give you a rush. This kind of thing happens from time to time--- it's not an everyday occurence, but it's not all that rare, either. What differs is the extremity of the situation, how close to the wire it can get. There are legions of war stories like Javier's, with all sorts of hilarious and terrifying twists and turns, that dancers love to recount to each other and reminisce about. Costume mishaps, blanking out on choreography-- and then ad-libbing, missed entrances, entrances (or exits) at the wrong time, and of course all sorts of "learn the role five minutes before curtain" type scenarios. The best is when the funny ones are caught on tape and we can relive the laughter over and over again!